Published Mar 20, 2018 By Julia 19 CommentsThis post may contain affiliate links. 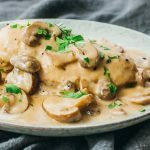 A quick and easy chicken marsala recipe with a creamy sauce in the Instant Pot pressure cooker. Low carb, keto, and gluten free. 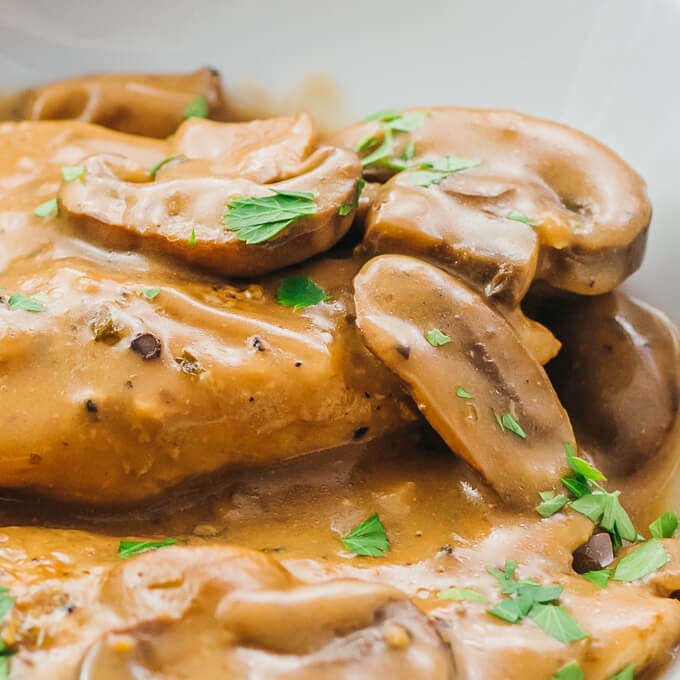 This Instant Pot chicken marsala recipe is an easy weeknight dinner, taking only about 30 minutes for prep and cooking. 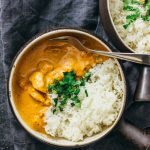 It reminds me of other simple pressure cooked chicken dishes like chicken tikka masala or chicken with creamy mushroom gravy. 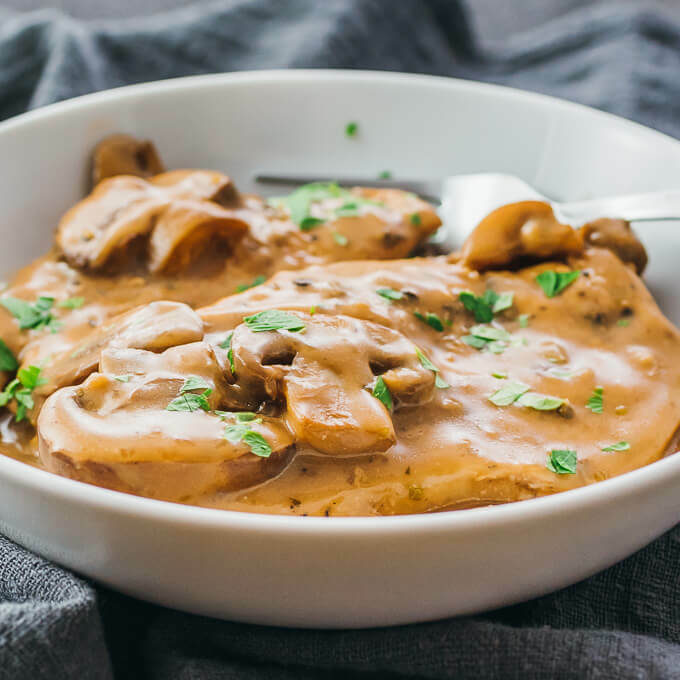 My favorite part about this recipe is the marsala wine sauce — rich, savory, and great when paired with sliced mushrooms. 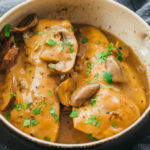 The creamy sauce is a mixture of dry marsala wine and heavy cream, and is thick enough to coat the chicken and mushrooms. Chicken marsala is typically prepared using chicken cutlets, so I use 2 boneless and skinless chicken breasts that are sliced horizontally in half to make them thinner. Traditionally, these cutlets are coated in flour and briefly sauteed, but since I wanted a healthier version to suit my low carb lifestyle, I’ve skipped that step and it still tastes fabulous. I also opted not to prepare the sauce by reducing the marsala wine to a nearly syrup consistency, as is traditionally done. That would require much more marsala wine than I’d like for a low carb dinner, since there are 16g carbs in just 1/2 cup of marsala wine. Instead, I use a bit of corn starch to help thicken the sauce, and I submerge the chicken and mushrooms in marsala wine during pressure cooking to help soak up the flavor. The end result is not traditional, but is undeniably good. I also like to add a squeeze of lemon juice to the marsala wine sauce to give it a bit of freshness. Use dry marsala wine — I use an Italian brand called Versasi. If you can’t find dry marsala wine, you can also use anything labeled as marsala cooking wine. 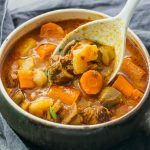 I use a 6 quart Instant Pot pressure cooker. Smaller pressure cookers will also work. If you have a larger pressure cooker like 8 quart, I suggest doubling the recipe’s ingredients (keep the pressure cooking time the same). 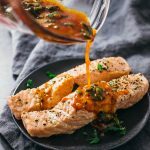 You can enjoy this dish as-is, or serve with sides such as greens, spiralized zucchini, cauliflower rice, or these Instant Pot green beans. For people not on a low carb diet, you can serve with pasta like rigatoni or linguine. The recipe makes enough sauce to coat any pasta or noodles you may serve with. If you have leftovers, cover and store in the refrigerator. They will reheat well in the microwave. 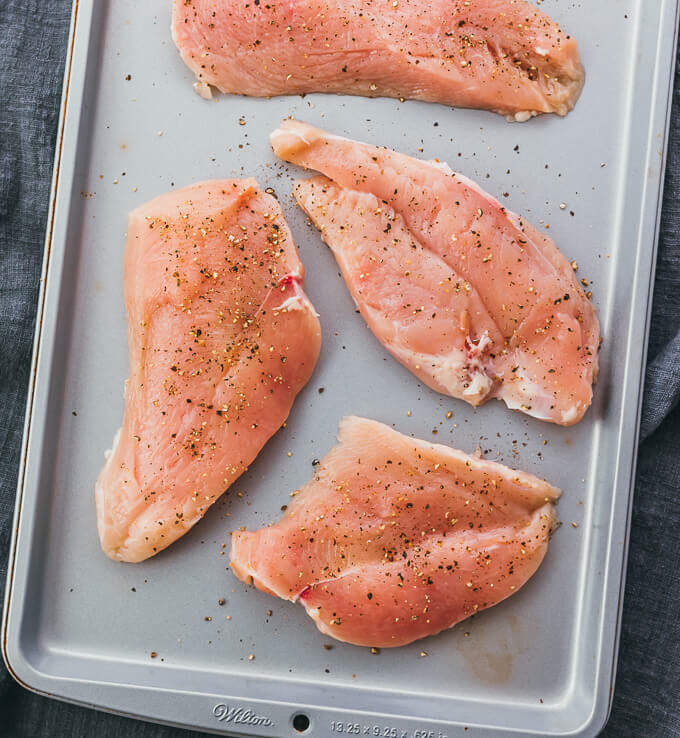 Slice each chicken breast horizontally in half to make it thinner. Pat dry with paper towels. Generously season all over with salt and pepper. Select the saute mode on the pressure cooker for medium heat. Add olive oil to coat the bottom of the pot. When the display reads HOT, add garlic and mushrooms, cooking for a few minutes until they start to release their juices, stirring frequently. Turn off the saute mode. Add marsala wine and briefly scrape up any brown bits stuck to the bottom of the pot. Add heavy cream, lemon juice, and oregano, and stir everything together. Add chicken on top of the mushrooms, arranging the chicken in a single layer if possible. Press down on the chicken pieces so they’re barely submerged in the wine sauce. Secure the lid and seal the vent. Cook for 4 minutes at high pressure. As soon as it’s done, manually release the pressure. Uncover and transfer only the chicken to a plate. Turn on the saute mode. In a small bowl, combine corn starch with 2 tablespoons of cold water and stir until dissolved. Add to the pot and simmer for a few minutes to thicken the sauce a bit, stirring frequently. Turn off the saute mode. Add the chicken back to the pot to let it briefly soak up the sauce. Serve while hot and garnish with chopped fresh parsley. Hi there! I’m kind of a beginner cook and I was wondering when you say to turn off the sauté mode, what do you change it to? I’m excited to try this recipe but just want to be sure I do everything correctly! Turning off the saute mode means pressing the red cancel/keep warm button (note that the color or wording of the button may be different for your pressure cooker model). By pressing that button, the saute mode is no longer activated. Let me know if you have any other questions. I haven’t tested this recipe with veal, so I can’t say what tweaks would need to be made. This is delicious! I’ve made it a few times and each time I want to lick the plate!! This is DELICIOUS and couldn’t be easier! The hardest part is cutting the chicken! I don’t like mushrooms so left them out. I could drink the gravy! Thank you so much for this awesome recipe! Trying this for dinner tomorrow night. Can’t wait! It makes cooking so much easier, right? 🙂 Hope you enjoy this meal! I don’t recommend using frozen chicken. Thaw overnight in the refrigerator, and pat dry with paper towels before using it in this recipe. This is my new favorite meal. I’ve made it 4 times in the past month and it is amazing every time. Thank you so much for the recipe. Any suggestions on how to make this dairy free? I am going to make it tonight with coconut cream. I always use that as a substitute for heavy cream. I keep a can of coconut milk in the fridge, so I can open it and use the cream that comes to the top! Much healthier! How’d it taste with the coconut milk? Did you ever get a response regarding the coconut milk? Can this made in a regular crock pot? This was divine!! Can I double this recipe? Absolutely! You can double the ingredients and keep the pressure cooking time the same.